The first approach with a mind-body system arrives through my family, that passes down to me, as a child the passion for taichi, qigong and martial arts. These passions still persist. As a boy I begin to attend the school of Hatha Yoga Sivananda and following this path I meet the Ashtanga yoga and Elena De Martin, that I will follow as teacher for quite some time. 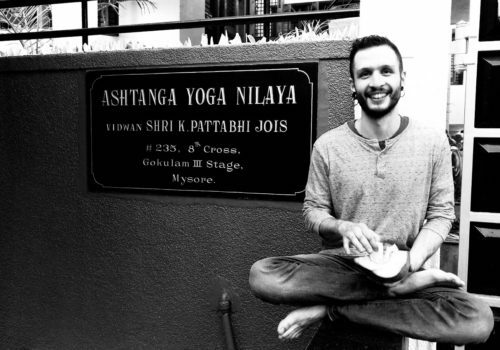 I begin to travel in India, to practise and know more about its traditions and disciplines, and at the KPJAYI of Mysore, where I get authorized to the teaching of the Ashtanga yoga. The curiosity for the yoga discipline drives me to also deepen other methods as the Iyengar and the yoga Centered of Dona Holleman, with whom I’ve studied several years. Being very influenced by this method I decided to get graduate in it; at the same time I learn different styles of massage widening the anatomical and functional knowledges of the body. Being really in to meditation, I also pursues the Vipassana meditation, participating in retreats and cultivating my study and the personal practice. At the same time, another great passions that accompanies me in this yogic journey since the beginning are mountain and rock climbing, that tie me to Nature. At the moment I continue my sadhana (spiritual practice) studying and constantly practising, sharing this passion in my classes, directing practitioners (students) to be aware of their own bodies and actions, making the yoga a tool of improvement.